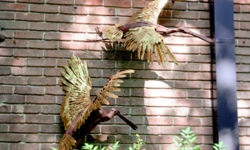 Spoonbills, a sculpture in Cor-ten steel and gold leaf, occupies a prime Houston Zoo location, being displayed at the entrance to the Birdhouse. It dates from 1966, and is the work of Robert Fowler. His African Elephant is well-known to Houstonians, being prominently placed at the Cambridge Street entrance to the Houston Zoo. 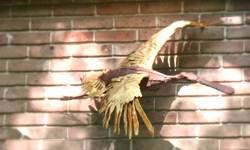 Fowler began his sculpting career in 1963 and received many awards throughout his life. Other Fowler works in Houston include Two Horses at Jones Hall, a sculpture in front of Colombe D’Or, and the centerpiece sculpture in the atrium of the University Center at the University of Houston. He died in 2010.